I know most of you are already aware that there is some controversy surrounding the book, "The Yankee Years." From my own understanding, it's a third-person narrative with Sports Illustrated's Tom Verducci. The book has interviews from some of Torre's former players such as David Cone. The controversy is that supposedly Torre said that teammates in the clubhouse were calling Alex Rodriguez 'A-Fraud'. Torre denies making such a comment in his first public statement on the book. What I did take from this article is that Torre makes no statements that are not already floating around within the media about Rodriguez's clubhouse etiquette. He "craves attention" and he sometimes "presses to hard to impress people or satisfy the fans." These are things most people can tell, or have heard before. Why is this a big deal? Because he is saying it? Torre is not the first person, and certainly won't be the last. He seems to merely suggest the change in the clubhouse upon A-Rod's arrival, and I have to say I don't see the problem with it. A-Rod is the highest paid player in baseball, and that subjects him to more criticism and controversy than most other players. My feeling on this whole situation goes back to a simple saying many of us use on a daily basis, "don't judge a book by it's cover." When people read things, they tend to take them in the context they understand them and that is fine. But just because one report found that Torre was critical, or leaking out the information of the Yankees clubhouse, doesn't mean that is what the book is about. Before all these websites, newspapers and TV shows report these things they should actually read the book. I have a hard time believing Joe Torre, the quietest and least confrontational personality seen on TV in the most pressure-filled position in sports -- and maybe the industry, would want to put himself in a position of ridicule or make a spectacle of some of the best years of his career in baseball. As for me, I will make a judgement once I get to read it. 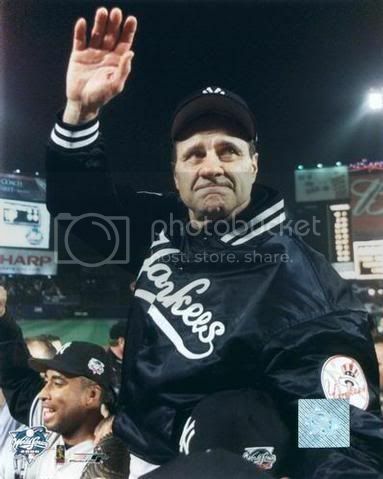 Torre has helped create many of my best Yankee memories so he will get the benefit of the doubt. I think the story in the Daily News, which quotes someone "close to A-Rod" tells me all I need to know. The person says A-Rod is not bothered by what Torre supposedly said, then mentions Torre batting A-Rod eighth in the Division Series in '06. "He believed that Torre did that to embarrass him, and he knew what Torre thought of him." Once again, A-Rod making the situation all about himself. Torre was trying to win a title and Rodriguez wasn't hitting, and A-Rod thinks Torre took the time out of everything he had to do to "embarrass" A-Rod. A-Rod has never gotten out of high school, mentally. That's his problem. Torre is without criticism as far as I'm concerned, at least until I see the book. And that's not because he's wearing a Dodger uniform either. That's a great point about him being moved in the line-up. How was that about him is right. 8 more years of him. Part of the controversy surrounds an implication that A-Rod hero-worshipped and emulated Jeter, to a disturbing degree. At least that's what the NY Times review said, but the fact is, people have to read the book! Then when they get all judgmental, at least it will be based on something resembling facts.